The moment I first saw and felt a blabla creation, I was smitten. These are beauitfully designed and softly made pieces that have garnered much fanfare throughout the US and abroad. The company began in Atlanta after best friends Florence Wetterwald and Susan Pritchett took a trip to Peru and by accident, met an amazing and dedicated community of knitters. 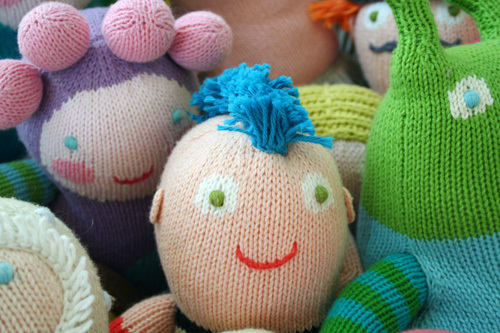 They were inspired by this community's love and care for their craft and decided then to create their own product line of knitted products for kids. Susan is from Georgia and Flo from France and both now reside in Atlanta. Longtime friends, the two have always loved to share ideas and creative endeavors. Now, they're running an ever growing empire and have struck an efficient, happy balance. As Susan explains, "We have different tasks but one vision. Flo does all the designing and the image of blabla, while I am responsible for the communication with all the press and clients and manage the day to day goings-on." The dolls are blabla's best seller and there's certainly one for every personality. Both Susan and Flo have worked with the same knitters in Peru for eight years and have developed a strong bond and working relationship. They've helped employ over 100 Peruvians who live throughout the country, which is really quite an amazing feat. When you see a blabla doll, you have to hold it as it's super cozy and cuddly, primarily because Peruvian cotton is of high quality and especially soft. Susan explains, "It is handpicked so there are no impurities as with machine picked cotton." Their color palette is especially appealing as well. Susan adds, "It's soft without being boring. We create interesting contrasts of tonality." 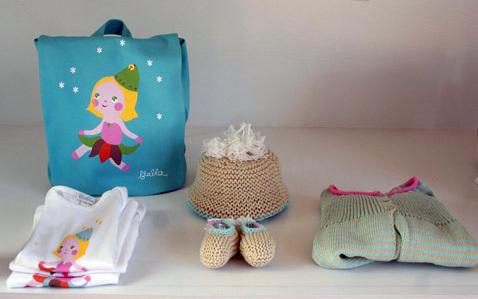 I knew blabla made adorable dolls but I didn't know about their beautiful children's wear. Susan explains its inception, "We have never thought of ourselves as a children's clothes company, just a children's company who wants to make kids smile. 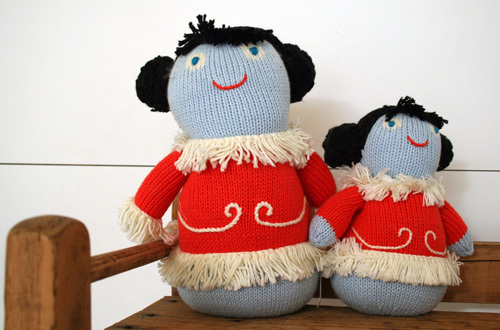 So our clothes have always been created spontaneously and with playfulness like our dolls." Susan, "We started with sweaters and hats with a puppet in the pocket, then pants and booties to match...then tees for the kids who wanted to show off their favorite doll. The evolution has been very organic like everything we do. The moms are very fond of our clothes because they have a timeless appeal and a high quality to them." I love the design of this pillow. They got their inspiration from the well known children's cup, Dombo, with handles designed by Richard Hutten. As Susan explains, "Oversized handles are appealing for small hands." Look for new blabla features in the near future including apps, books and animation shorts.